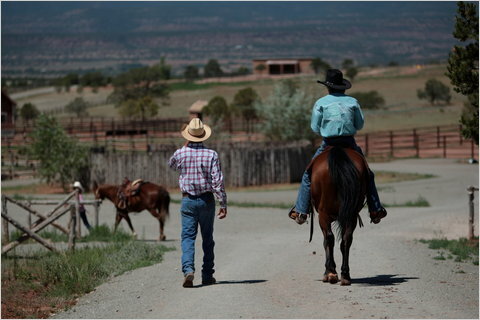 Mark Holm for The New York TimesDon Imus, on horseback, at the Imus Ranch in New Mexico, which welcomes kids with cancer. I recently had the opportunity to spend a week as the doctor at the Imus Ranch for Kids With Cancer in Ribera, N. M., founded by radio personality Don Imus and his wife, Deirdre Imus. Camps for children with cancer have been around since the mid-1970s. Thanks in part to Betty Ford’s courageous public discussion of her breast cancer diagnosis in 1974, people with cancer had begun to talk more openly about their disease. Although children with cancer had always met on the wards, and social workers talked with them and their families about their cancer, these encounters only scratched at the surface of these life-changing experiences. Today there are over 70 such camps worldwide. It is a working ranch, replete with cowboys, cattle and horses. Although there is a swimming pool, pinball machines and a pool table, “fun” is not the primary objective. Rather, the children themselves — who have either had cancer or are “healthy siblings” — serve as ranch hands, learning to ride horses, participate in a rodeo and do chores. The point? They can do anything that their healthy peers can. Nor is there McDonald’s food, candy or ice cream. Instead, there’s chemical-free hearty vegan fare, which some of the kids loved and others just tolerated. A week at the Imus Ranch is full of lessons and reality checks. For example, only 2 of the 10 children who attend each weekly “go-round” win prizes — one for the best overall time in the rodeo, and one for displaying the best attitude during his or her stay. “In life, everyone isn’t always a winner,” Mr. Imus told his new ranch hands. In some ways, being a doctor at the Imus Ranch wasn’t all that different from what I usually do as a physician who treats “walk-in” patients. After long days spent working, the kids came to me with a series of minor ailments ranging from rashes to stomachaches to headaches. Having been given summaries of their medical histories, I was able to make the proper treatment recommendations. I was also, I must admit, the water boy, always present when the children were working in the barn or competing in the rodeo, and making sure they did not become dehydrated. Although I didn’t need extensive medical training to perform this duty, it did enable me to interact frequently with the children and get to know them better. This was pretty fun for me. I am not a pediatrician, and my own teenage children are at the age where they generally prefer not to speak with me. But here were a group of children who laughed at my silly jokes and seemed to like and respect me. And it was hard not to like and respect them, whether they had gone through cancer themselves or had a brother or sister with the disease. I was curious to ask them about the details of their cancers and how they had survived such an ordeal, but I followed the ranch rules and did not. Still, it was possible to see some of what their bouts with cancer had left them with: a quiet resilience and maturity that most other children their age probably do not have. They were also incredibly comfortable speaking with me and the other ranch staff, perhaps because as children with cancer they are used to interacting with lots of doctors and other adults as they fight their disease. It was hard not to be impressed. Fortunately, there were no medical emergencies during my stay at the ranch, especially no bites from the snakes that lurked in the desert brush. The one child who got sick while I was there responded to a little extra medication and a lot of TLC. That is something I frequently prescribe in upper Manhattan. At the Albuquerque airport, where the children and I were waiting to board planes home, I did my own quick outcomes research. “So what did you think of the Ranch and the Imuses?” I asked. All of the kids said they were glad they went, although they could have lived without weeding in the hot sun and getting up at 6 a.m. Caring for their own horses was a highlight, as was learning how to rope a plastic calf. They clearly loved Deirdre Imus, their surrogate mother, who spent much of her day assisting them, attending to their problems and warning them against the evils of junk food. And while Don Imus, true to his radio persona, was curmudgeonly at times, the kids gradually bonded with him as well. I ultimately concluded that a randomized controlled trial wasn’t needed to ascertain the value of camps — or ranches — for children with cancer. Parents need to do their homework, making sure that the establishment is reputable and has excellent medical facilities. But there is little not to like about giving children who have had a rough ride a week of something totally different that caters to them exclusively. But don’t send them to the Imus Ranch unless they are willing to work! Beckenrah Farm, Landsman Kill Trail Association and Locust Hill Farm have joined together for a hunter pace series. You must ride all three hunter paces to qualify. When registering or signing in the day of the pace, be sure to let the secretary know that you are riding in the Hudson Valley Pace Series so that we can track your team. You must do this at each of the three hunter paces. The ideal time will be set by each individual hunter pace. Each team’s time will be reported to the series secretary. The secretary will NOT look at whether the time was over or under, just the time difference from the optimum time. Then the three times will be added together and the team who is closest to the optimum time (lowest overall distance from the optimum times) will be the winner. The prize will be awarded after the pace series. Please email hudsonvalleypace@hotmail.com if you have questions. The Grafton Trail Riders host 4 gymkhanas, or games on horseback, each summer. Non-members are welcome to participate in these events! Be sure to get on our mailing list if you are interested in receiving a list of gymkhana events in advance. Juniors and seniors may compete in all 6 designated events. Events are timed, based on elimination, or both. Time penalties are added if a rider is off course or fails to complete part of an event. Ribbons are awarded for the top 6 placing riders, and points are awarded. The junior and senior riders with the most points at the end of the year will receive a trophy. In the pewee division, everyone gets a ribbon or a treat! Helmets are reccomended for everyone. Everyone under 16 MUST wear a helmet! Saratoga Race Course is full of excitement and special events all season long, so get in on the action! Use this Saratoga Race Course 2010 schedule to plan your visit. July 23, 2010 Opening Day The races begin at the Saratoga Race Course in late July each year. The gates open at 11:00 am and first race post time is 1:00 pm. July 23 - 24, 2010 Hats Off to Saratoga Festival On Friday and Satuday take part in a downtown Broadway music festival and celebrate the opening of the racing season. Friday, July 30, 2010 Party at the Park Formerly known as Sunset Racing days, July 30th is the first of two days during the 2010 racing season where the first first post time is at 2:30 pm. Gates open at 12 noon. Friday, July 30, 2010 College Day During the first Party At The Park event, college students will have a shot at winning a $1000 scholarship after each race of the day. Aug 20 - 29, 2010 Travers Festival A week long festival of equine-oriented events as well as many fun family events and community competitions. Friday, Aug 27, 2010 Battle of the Brews From 12 to 4:30 pm you can taste and judge over 50 different micro brews in the backyard. Battle of the Brews is brought to you by the American Red Cross. August 28, 2010 Travers Day Also nicknamed the Midsummer Derby, the Travers Stakes is the oldest major thoroughbred race in the nation, and the most highly anticipated event of the Saratoga meet. Sept 3, 2010 Party at the Park Formerly known as Sunset Racing days, Sept 3rd is the second of two days during the 2010 racing season where the first first post time is at 2:30 pm. Gates open at 12 noon. Sept 4 - 6, 2010 Final Stretch Weekend On Friday visit the track for sunset racing. A downtown music festival will take place on Satuday and Sunday. The Annual Family Fun Fest will take place on Sunday and Monday. Sept 6, 2010 Closing Day - Labor Day BBQ The meet concludes with a traditonal Labor Day BBQ on Monday. Just 90 minutes North of the Big Apple's mayhem, you'll find Saddle River Farm, nestled in beautiful Dutchess County, NY, a place where horses and country living set the pace. SRF is a horseman's paradise with million dollar views, spectacular amenities, show quality horses/ponies and unsurpassed expertise. SRF was created for horse enthusiasts to enjoy riding at its best and forget the routine of daily life. SRF has been featured in the NEW YORK POST, POUGHKEEPSIE JOURNAL, THE LEDGER and many more. Our riders & horses/ponies have made headlines across the nation. SRF boasts a long list of accomplishments and accolades. The facility has been designed and professionally built to meet the needs of the discriminating horse person. SRF caters to trail riders, recreational/pleasure riders and to those with a view for competition. The relaxed and friendly atmosphere encourages improved communication and partnership for horse and rider. SRF is just a short haul to the Millbrook and Rombout Hunt trails and is centrally located making attendance at horse shows a breeze, including a simple commute to the HITS show grounds. Or take a leisurely drive to the village and soak in some of the local culture with foods for almost any palate and a bit of shopping at Heart and Soul Tack Shop, one of the chic boutiques or antique dealers. SRF feeds the finest hay and grains on a personalized nutritional program to fit each horses' or ponies' requirements. By strictly numbering the number of horses/ponies that stable with us, we are better able to provide personalized, luxury care for each horse/pony. Visitors and guests of SRF include Olympic Gold Medalist and (former) U.S.E.T. coach, Michael Page, Intercollegiate Coach and USEF 'R' Judge, Mary Jane Mitchell (Mary Jane Mitchell was the recipient of the prestigious National PHA 2006 Frank J. Hawkins Award which was presented by Walter Distler at the FWPHA Awards Dinner) and many other famous horse people and business people. We offer an excellent selection of horses and ponies available for sale or lease to fit almost everyone's needs and pocketbook. Consignment horses/ponies are considered for representation by our team of experts, including lifetime certified equine appraiser, Ms. Leah Struzzieri, the East Coast partner of the nation's leading horse valuation firm, Sterling Equine Appraisals. Make plans to host a decorated fiberglass carousel horse at your place of business or along Main or Partition Streets by becoming an Artist Benefactor. At the Saugerties Area Chamber of Commerce-sponsored “Hors’n Around Saugerties” event, horses will be available for as little as $550 and will be decorated by a juried artist who will be selected by the sponsor. Horses will be on display all summer throughout the Village and will be auctioned in September at the Merry-Go-Round Auction & Gala. We organize the Carousel Horse events. You have fun and promote your business through “Hors’n Around Saugerties 2009”. Partner with another business to sponsor a horse. Official “Hors’n Around Saugerties 2009” Guide and Map. of Saugerties from May – August of 2009. Be sure to sign up for your horse before the herd is all adopted!! This is a COMMUNITY WIDE PUBLIC ART event and we encourage participation by all businesses, organizations and individuals. Saugerties students will be given the opportunity to join in the fun by decorating a “Flat Horse”. These special horses will be on display in Village windows and sold at a Silent Auction at the Merry-Go-Round Auction and Gala. Become an Artist Benefactor today!!! Join the many Saugerties businesses and organizations, including the Village of Saugerties. July 27, 2009 Annual Open House Many activites such as equine demonstrations, non-wagering races, handicapping seminars, backstretch tours and family activities can be expected. July 29, 2009 Opening Day The races begin at the Saratoga Race Course in late July each year. The gates open at 11:00 am and first race post time is 1:00 pm. July 31 - Aug 1 Hats Off to Saratoga Festival On Friday and Satuday take part in a downtown Broadway music festival and celebrate the return of sunset racing to Saratoga (2:30 post time on Friday, July 31). And don't forget your hat because this weekend features the 18th Annual Saratoga Hat Contest. Aug 22 - 30, 2009 Travers Festival A week long festival of equine-oriented events as well as many fun family events and community competitions. August 29, 2009 Travers Day Also nicknamed the Midsummer Derby, the Travers Stakes is the oldest major thoroughbred race in the nation, and the most highly anticipated event of the Saratoga meet. Sept 4 - 7, 2009 Final Stretch Weekend On Friday visit the track for sunset racing. A downtown music festival will take place on Satuday and Sunday. The Annual Family Fun fest will take place on Sunday and Monday. Sept 7, 2009 Closing Day The meet concludes with a traditonal Labor Day barbeque on Monday. Check this page for frequent updates as more events are announced during the 2009 season.